He may not have made it onto the £10 banknote, but the face of WWII code-breaking hero Alan Turing now adorns the back of the silly money that's boxed into a new custom Monopoly set. 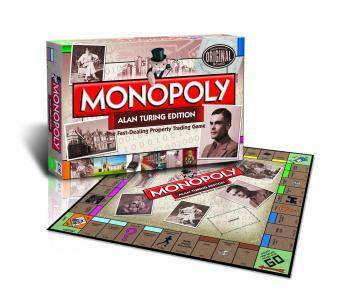 The board, cards and pieces in the "Alan Turing edition" of Monopoly have been tweaked to tell the story of Turing's life, with the Utilities squares replaced by the Enigma machine and Bombe, the hotels and houses replaced by the huts and blocks of Bletchley Park, Bletchley Park itself replacing Mayfair and Turing's old university college – Kings College Cambridge – replacing Park Lane. Community chest and chance cards include one which pays for a private detective to find Turing's teddy bear Porgy, one which pays out rewards for cross-country running, published papers, and the missive 'Auntie Flo is not so well' (which was the secret phrase alerting the code-crackers to go immediately to Bletchley Park), which replaces the traditional Go To Mayfair'. The board itself is roughly based on a board that was hand-drawn sometime around 1950 by William Newman, son of Turing’s mentor, Max. The young William apparently played on the same board against Turing, who apparently lost the game. The board, complete with the young William's own rules, has been in the possession of the Bletchley Park Museum since 2011. Newman collaborated with board game company Winning Moves on making the new board, which is based on the original specimen held in the Bletchley Park museum. Alan Turing 100: Visionary, war winner ... game maker?